Ready to Volunteer? Come solo or create a team of your favorite friends, co-workers, and family members. We work every Friday and Saturday in Chicago Heights and Park Forest. For groups of 3 or more, please call Daryel Wexler at (708) 441-4379. All skill levels are welcome. Tools, instruction, and supervision are provided. We are always looking for dependable, dedicated volunteers. Come alone, with a friend, or in a group. No matter how you volunteer, we will find a place for you! 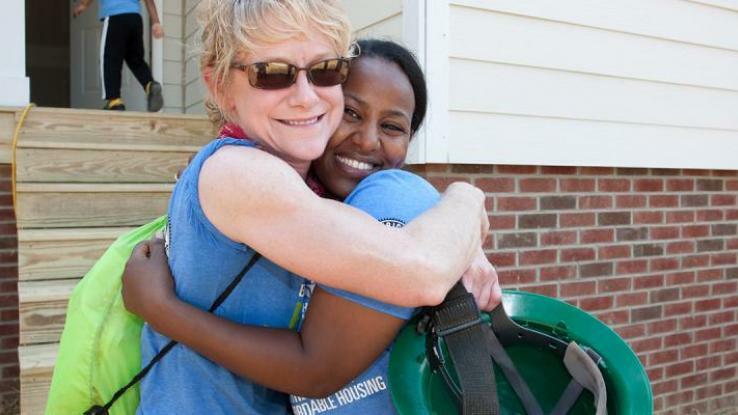 There are many opportunities for volunteering with Habitat for Humanity Chicago South Suburbs. Most people think first of working on a house and that is indeed where a majority of volunteer hours are accumulated. However, we also need volunteers to work at the ReStore and in our Frankfort office to help with fundraising activities, provide social media support, energize a marketing campaign, or to serve on a committee. Click here to learn more about committees. 1. What’s are the hours? 7:45 a.m. to 3:30 p.m.
3. Do I have to work the entire day? No but we hope you will try. The most important thing is to be at the site at 7:45 a.m. as that’s when we provide our site safety lecture and make assignments. Habitat ReStore: Help us by working as a sales clerk or “behind-the-scenes” preparing donations for sale. The store is open Wednesday, Thursday and Friday (10-6pm) and Saturday (10-5pm). We are closed to the public Sunday, Monday and Tuesday. You can register to volunteer by clicking on the link at the top of the page. Family Development: Recruit and interview families who have made application to be a partner family with HFHCSS. Guide and support our partner families through the sweat equity process, the title closing and the early phases of home ownership. Construction: Develops building standards, identify contractors, and solicit in-kind donations of goods and services. Finance: Provides oversight and policy recommendations to the board on matters pertaining the affiliate finances.